The Workshop on Advances in High-Pressure Science using Synchrotron X-rays, held on October 4th at the National Synchrotron Light Source, was a tremendous success. 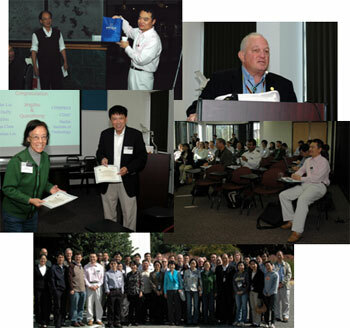 The workshop was organized in honor of Jingzhu Hu and Quanzhong Guo in celebration of their retirement after up to 18 years of dedicated service to the high-pressure community. Hu was the beamline scientist of X17C, the first synchrotron beamline in the world dedicated to high-pressure research. The beamline, which was created and managed by Carnegie for many years, was later complemented by X17B, which was led by Guo. 47 participants from 18 institutions were present at the workshop. CDAC partners Yangzhang Ma (Texas Tech) and Jie Li (University of Illinois, Urbana-Champaign), presented talks, along with Carnegie scientists Ho-kwang Mao, Alexander Goncharov, Yingwei Fei, and Michelle Weinberger.